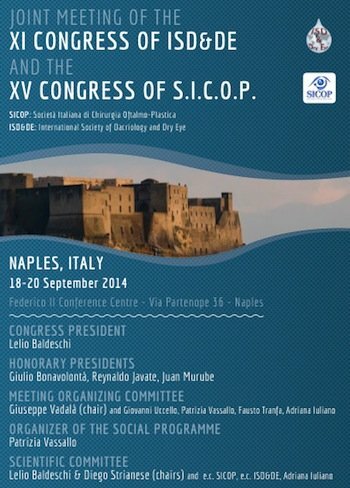 We are glad to announce the join meeting of the Italian Society of Ophthalmic Plastic Surgery (SICOP) and International Society of Dacryology and Dry Eye (ISD&DE) and to cordially invite you to participate. The meeting will be held in Naples on 18, 19 and 20 September 2014 on occasion and just following the annual reunion of the Orbital Society. This fortunate and unique concomitance of events will bring to Naples the most prominent experts in the field of oculoplastic, orbital and lacrimal surgery at a world level. A symposium of the European Group on Graves’ Orbitopathy (EUGOGO) and of the International Thyroid Eye Disease Society (ITEDS) will also enrich the congress programme. Finally daily lunch symposia will cover practical aspects of hot topics in dacryology and dry eye. In the same days, Naples will be animated by the world famous celebrations for Saint Januarius, the city Saint Patron. With such premises the join meeting SICOP-ISD&DE 2014 will represent not only a great attraction for all those colleagues involved internationally in the field of orbit, oculoplastic, dacryology and dry eye, but a unique occasion to live an Italian experience embraced by local devotion and folklore simultaneously enjoying one of the most beautiful Italian cities, which is culturally and artistically renowned worldwide.